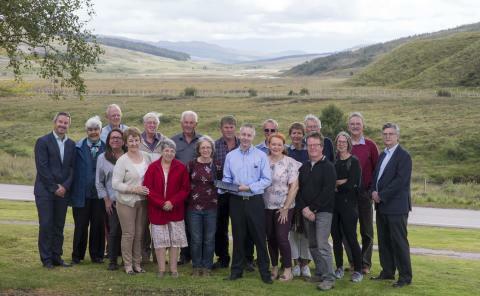 Cap 1: The community launches their unique broadband partnership in Achnasheen with Openreach’s Robert Thorburn (far left); HIE’s Stuart Robertson (far right) and Ledgowan Lodge Hotel’s Craig Duffield (centre). Cap 2: Openreach’s Rob Thorburn and community spokesman Steve Jones in the village of Achnasheen. Cap 3: Engineers use specialist equipment to continue to lay armoured cable outside Achnasheen. Further pictures by photographer Jeff Holmes are available free of charge on request. Enquiries about this story can be made to Anna Steven in the Openreach PR team at press@openreach.co.uk or 0131 448 3933 or Steve Jones at Garve & District Broadband on sdjscot@yahoo.com or 07970 574037. All news releases can be accessed on our web site. GDB (registered charity number SC047481) was established by the community in 2016 to bring better broadband to the Garve and District Community. It launched a satellite subsidy scheme in May 2015, funded by the LCT, to enable people with poor broadband to get a decent temporary internet service pending a more permanent long term solution. It has six volunteer Trustees. In a 2016 Community Needs survey, a faster and more reliable broadband service was the highest priority development project for the Grave and District community. The DSSB programme was set up to deliver fibre broadband to communities not included in any commercial roll-out. It’s delivered through two projects – led by Highlands and Islands Enterprise in its area and the Scottish Government in the rest of Scotland. Funding partners also include the UK Government through Broadband Delivery UK (BDUK), BT Group, local authorities and the EU via the European Regional Development Fund. The programme reached its target of delivering fibre broadband to 95 per cent of Scotland (when coupled with commercial deployment) by the end of 2017 on time and on budget. As a result of innovation and new funding generated by stronger than expected take-up, the programme will continue to deliver additional coverage in every local authority area during 2018 and beyond.